There’s a fungus growing on this rotten log in Yarner Wood on Dartmoor. It’s the Sheathed Woodtuft, Kuehneromyces mutabilis. It has wonderful circles on its cap where it’s drying out. It’s an edible fungus, used in soups and stews, although the stalks are too tough to eat, even when cooked. I’ve never tried it. It’s almost identical to a poisonous species, and when I say poisonous, I mean deadly poisonous. Its poisonous body-double is Galerina marginata, which is nearly indistinguishable, even by people who are very knowledgeable. Both of them soak up water and change colour when they dry out. The books describe that as being hygrophanous. 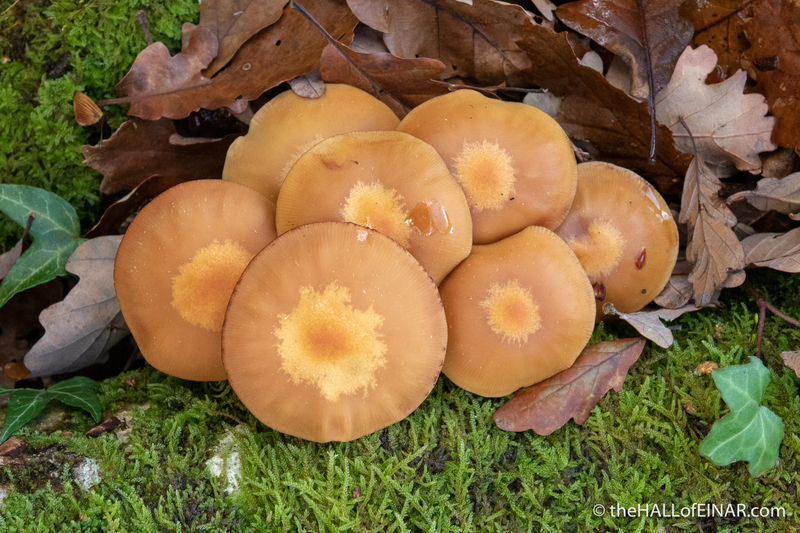 The difference is that Kuehneromyces mutabilis dries from the centre outwards, so it has a lighter colour in the middle and Galerina marginata dries from the edge inwards, so it has a lighter colour at the edges. Would you trust yourself? It’s the difference between tasty soup and death.